Shortcomings in design and certification ultimately led to the fire in a lithium-ion battery installed on a Boeing 787 jetliner that had just completed an intercontinental flight to Boston, the NTSB determined in its final report on the incident. On January 7, 2013, ground workers discovered smoke and flames coming from an auxiliary power unit lithium-ion battery in a Japan Airlines 787 that was parked at the gate at Boston Logan International Airport. There were no injuries to any of the 183 passengers or 11 crewmembers that had already deplaned after flying from Tokyo’s Narita Airport. The battery was manufactured by GS Yuasa Corporation. 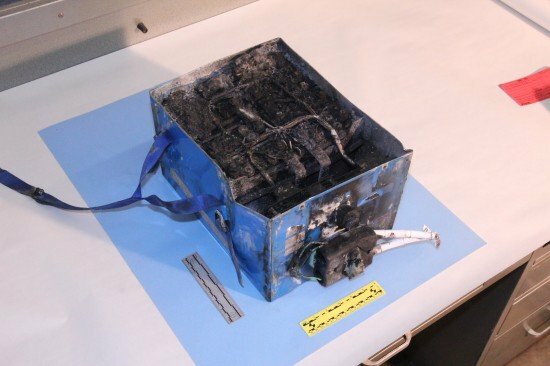 Early in the investigation, the NTSB said that the fire began after one of the battery’s eight cells experienced an internal short circuit leading to thermal runaway of the cell, which propagated to the remaining cells causing full battery thermal runaway. This condition caused smoke and flammable materials to be ejected outside the battery’s case and resulted in excessive heat and a small fire. Because the APU and main lithium-ion batteries installed on the 787 represented new technology not adequately addressed by existing regulations, the Federal Aviation Administration required that Boeing demonstrate compliance with special conditions to ensure that the battery was safe for use on a transport category aircraft. Investigators said that Boeing’s safety assessment of the battery, which was part of the data used to demonstrate compliance with these special conditions, was insufficient because Boeing had considered, but ruled out, cell-to-cell propagation of thermal runaway (which occurred in this incident) but did not provide the corresponding analysis and justification in the safety assessment. As a result, the potential for cell-to-cell propagation of thermal runaway was not thoroughly scrutinized by Boeing and FAA engineers, ultimately allowing this safety hazard to go undetected by the certification process. As a result of its findings, the NTSB is recommending that the FAA improve the guidance and training provided to industry and FAA certification engineers on safety assessments and methods of compliance for designs involving new technology. NTSB investigators also identified a number of design and manufacturing concerns that could have led to internal short circuiting within a cell. As a result of the investigation, the NTSB made 15 safety recommendations to the FAA, two to Boeing, and one to GS Yuasa.